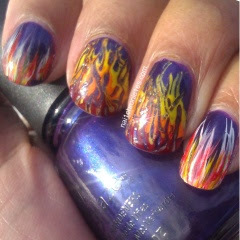 This Girl Is On Fiyyyyaaaaaa!!! Singing Alicia Keys yet? If the answer was yes, do you hate me yet? Shoutout to everyone who passed Monday with flying colors. Yes, Mondays are just a test! So I recently started playing around with acrylic paint. Let's just say the pinky and pointer wasn't my original desired look. So after making a "beautiful disaster", of what appeared to look like flames, I decided to revisit a design I did a few months ago. I explain how to achieve this look after the jump. 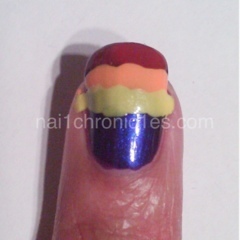 Step 5: Add topcoat, cuticle oil and boom... 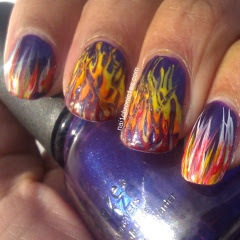 FIYYYAAAA!!!! 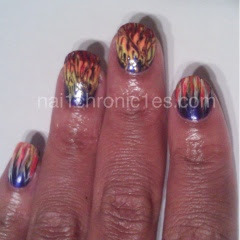 I used China Glaze's Bizzare Blurple as my base but you can use whatever your heart desires. Easy peasy right? Now back to trying to figure out these acrylics, brushes, and what made me think this was a good idea to start with. Have a terrific Tuesday! Oh myyyy... These are DOPE!!!! !